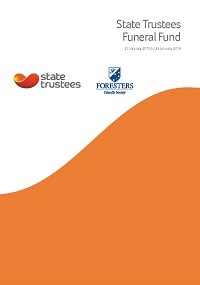 The State Trustees Funeral Bond is a capital guaranteed investment whose specific purpose is to contribute towards future funeral expenses displaying features and benefits similar to the Foresters Funeral Bond. Got a question? Take a look at our Funeral Bonds FAQs or download the product disclosure document here.